Located in one of Arizona's most upscale towns, Paradise Valley properties are generally upper class investments. The city is an extension of Scottsdale, and should not be confused with the Phoenix neighborhood called Paradise Valley. Paradise Valley is the home to twelve luxury resorts and it’s one of Arizona’s major tourist destinations. The homes in Paradise Valley are incredible and large. Residents love living in Paradise Valley because of the friendly people and atmosphere, while living in the lap of luxury. The town is surrounded by the majestic Camelback Mountain to the south and the McDowell Mountains to the east. Residents love that the town has a number of things to do in the area. There are many shops in the area, golf courses, parks, fine dining, and outdoor recreation. The homes in Paradise Valley are large estates that are perfect for those who need large homes and luxury in their life. The median home value is $1,483,600. 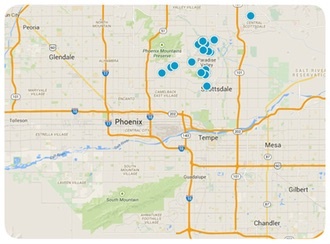 The median price per square foot is $395 and this is higher than Phoenix Metro’s median of $124. With a multitude of resorts and luxury entertainment, real estate in Paradise Valley is right in the midst of fine living. While a Paradise Valley, Arizona home for sale may be on the pricier side, the benefits make the cost well worth it. The town is a great place for families, and the small size of the community fosters small-town values. As your Paradise Valley REALTORS®, the Russell Shaw Group will do everything we can to find the perfect home for sale in Arizona, and also to secure the best possible price. We value your satisfaction and know that you will be pleased with the work we do in finding your dream home. Contact us today and let your Arizona REALTOR® get started right away!